It finds that balance between performance and not being too complicated, as most vape mods would be. If you’re venturing into the world of CBD oil vaping, you shouldn’t hesitate in picking up the CBDfx vape kit. This CBDfx vape kit has been a product we’ve been eyeing ever since it came out. It seems CBDfx is trying to cover all aspects of CBD vaping and we’re behind them all the way. With their first foray into this part of vaping, will the CBDfx vape kit match the high standards we expect from this brand? While CBDfx has carried a line of CBD vape oil for quite a while, you always had to buy something else to use it. If you’ve never vaped before, it can be daunting to pick out something that is not only good but also works well with CBD vape oil. 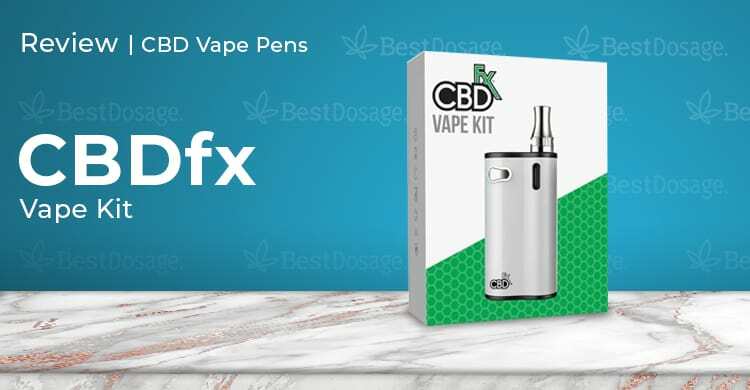 Thankfully, CBDfx put together this CBD oil vape kit that is specifically created for that purpose. It is set for the temperature needed so you don’t burn your oil. They call it a vape pen, but it is really more like a basic vape mod in how it is structured and functions. It uses an internal 1000mAh Li-ion battery that is recharged using the included USB cable and comes with a high-quality ceramic glass/steel cartridge. We’ve had our fair share of vape kits, but this was the first one we tried that is made specifically for CBD vape oil. To begin with, the packaging looked absolutely top notch. Sometimes you get vape kits that look like some guy in China with no idea of design for the western market made it. On the contrary, the CBDfx vape kit comes in a box that is clean looking and prepares you for exactly what you’re about to open. Not that it’s a huge deal with the box looks like, but it gives you an idea of how much attention to detail the company puts in as a whole. Taking it out of the box, we were really impressed with how small and lightweight it is compared to other vape mods. Of course, it isn’t as small as a CBD vape pen, but it’s still incredibly portable. We were able to fit it into our pockets with ease, and it fit into some pretty small purses as well. Beyond the size, it also looked and felt like a very good quality device. It’s shiny and smooth and feels really nice in your hand. The cartridge was indeed very easy to fill and it simply screws into the base unit, and with the click of one fire button, you are off vaping. We also liked that it hides the tank into the unit itself, so your CBD vape oil isn’t directly exposed to sunlight. That’s all well and good, but how does it vape right? All of us on the team here who tried it likened it to a step up from a vape pen, but perhaps not to the level of a more professional vape mod. That’s not a bad thing at all, because the CBDfx vape kit is aimed at the newer user. For instance, it has four temperature settings but none of them go high enough where you might burn your CBD oil. On the flip side, it can seem to lack a bit in the power department. If you’re used to vaping with large plumes of vapor, this might be disappointing. Again, that’s not the point of this product. What is most important is that it heats up CBD vape oil to the right temperature and allows for maximum bioavailability. Trying a few different CBD vape oils, and we especially like the new CBDfx CBD oil with terpenes, we all got the rather instant effects we were expecting. This vape kit also did a great job recreating the flavors for all of the CBD vape oils we tried with it. It put out a little vapor so it was still fun, just not massive amounts. Truthfully, some of like lower profile vaping anyway so it worked out. Whether it is email, live chat, or their toll-free number, you’ll get a quick response and their staff is always super helpful. An extra tip? Try writing them on Instagram! They’ll get back to you just as quickly and you can do it right from your app. We’re happy that CBDfx finally provides an option for those new to vaping CBD. While their disposable CBD vape pen is perhaps the ideal first step for a new user, those can get costly. Being able to have a good quality vape kit that is meant for CBD makes things a lot less expensive, assuming you are willing to refill your own cartridge with CBD vape oil. We knock the CBDfx vape kit a bit because it is a little low in the power department and the battery life can be lacking if you use it constantly. That being said, this is still a great product and an easy entry into CBD vape kits. It finds that balance between performance and not being too complicated, as most vape mods would be. If you’re venturing into the world of CBD oil vaping, you shouldn’t hesitate in picking up the CBDfx vape kit.